Mexico makes you feel alive - the colors, the vibrancy, the friendly, welcoming people, the great hospitality, the superb cuisine, the great shopping, 1000s of years of history and culture and frankly, the good, old-fashioned values that make a place irresistible and unforgettable. Mexico is just a short flight away from the USA, and due to its reliable weather, it offers year-round horse riding opportunities! Mexican horse riding holidays combine the best Mexican culture, landscapes and cuisine with some excellent ranch style rides. Most of our rides take place on large working ranches, or between haciendas, giving you the opportunity to experience long gallops on un-fenced farmlands. Mexico is a fantastic choice for any horse riding holiday – especially if you want to experience North- or Central- America without traveling too far from the United States. Forget about the media stories you may hear ... all of these rides are located in perfectly save parts of Mexico. It is unfortunate that Mexico tends to have a bad reputation for horsemanship and horse care. This is mainly due to the many “side of the road” operations in the busy tourist towns. Make no mistake, however, Mexico is a great "Horse Country" with its large historical haciendas (colonial farm estates) and famous horse breeding programs, as well as Charros (cowboys), who are some of the best horsemen you’ll find anywhere. The key to a horse riding holiday in Mexico is to find a reputed operator, and Hidden Trails has traveled several times across Mexico and found some of the best horse breeding farms anywhere. 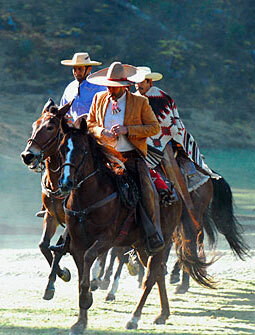 We have been able to select the top equestrian trips in North America for you - in Mexico! Gallop across open grassland, canter through beautiful woods, ride through small villages and at the end of each day relax in one the many superb fincas and haciendas like on the "Colonial Villages & Haciendas Ride. Other progressive riding tours are organized in a big circle ride, where the horses stay out on the trail, but you return to your comfortable finca at night, making it a relaxing and exciting trip at the same time. Explore the Highlands and Canyons in Central Mexico - and enjoy a Jacuzzi or swim in the pool at night before taking off on new adventures the next morning back out on the trail. Of course center based trip can be just as exciting or as relaxing as you like. Stay at a boutique hotel hacienda on the "Five Haciendas Ride” near Leon. One of our newest and spectacular rides is in the southern part of the country - in the state of Chiapas. Explore mountains, canyons and canter on the beach on the Mountains, Canyons & Coast Explorer of Chiapas ride. Whatever you choose, you’ll find riding in Mexico spectacular. Summer is the rainy season throughout much of Mexico, with Southern Mexico generally rainier than the north. Mexico's East Coast is wetter than the West Coast. Winters in Mexico are comparatively dry. The hottest months are generally March – August, and can reach 26º C (79 º F). The cooler months average around 15 º C (59 º F). This trip combines: adventure, adrenaline and nature exploration with relaxation in comfortable charming hotels and historic haciendas, as well as at a unique eco resort on a private island at the edge of the Pacific Ocean. Chiapas, once part of Guatemala, is the southernmost state of Mexico and the stage of our new unique riding adventure.